Quarterback Joel Lanning had lost his grip on a starting job, but the Cyclones couldn't afford to keep him off the field. Will Iowa State coach Matt Campbell's big idea pay off? FRISCO, Texas — The idea took root early in the second half of Iowa State’s season finale against West Virginia. The Cyclones were trailing 21–16, but something else was gnawing at head coach Matt Campbell. In their previous game against Texas Tech, Joel Lanning, ISU’s Swiss Army knife of a quarterback, had scored five touchdowns and run for 171 yards in a 66–10 victory, doing all his damage in special situations. But late in the season, Iowa State had turned to former Georgia quarterback Jacob Park, who is more of a traditional pocket passer, and it had been effective: The Cyclones came into the final week of the season on a two-game winning streak, and before that they had given Kansas State and Oklahoma all they could handle. Still, Campbell knew something wasn’t right. “Our program is not good enough where one of our best players is not touching the field,” Campbell said to his offensive staff through his headset, lamenting that there wasn’t an ideal situation to get Lanning in the game. As Campbell recalled Monday at Big 12 Media Days, Lanning only ended up playing two snaps against the Mountaineers and Iowa State went on to lose 49–19, bringing Campbell’s first season in Ames to a 3–9 finish. Still, he was excited about the direction of his program, and Park (12 touchdowns, five interceptions in 2016) seemed to be a better fit at quarterback going forward. The coaching staff began to kick around ideas of what to do with Lanning. Lanning had given opponents some headaches running the Cyclones’ offense: He threw for 1,290 yards and nine touchdowns in 2016 and was the team’s third-leading rusher with 518 yards. He also ended the season on a run of 121 consecutive passes without an interception, the sixth-longest streak in school history. He was at his best in short-yardage situations, though—they could move him to H-back. He’d certainly help the offense as a complimentary player. Campbell had a much more ambitious thought: Could Lanning move to middle linebacker? “Can we really get this done?” Campbell recalled thinking. Lanning was a former all-state wrestler at nearby Ankeny High School, is the toughest guy on the team, wins every race, would fight anybody in a phone booth, according to his coach. What's more, he essentially played quarterback like a linebacker, even though he last played the position in eighth grade. But how crazy would it be to have a guy who’d just started nine games at quarterback in the Big 12 one year and then try to have him play middle linebacker the next? This wasn’t a high school quarterback shifting to defense in college and growing into the position. This was something more radical. Two weeks later, Campbell brought the idea to Lanning. Campbell told him if this works as well as he thinks it will, Lanning’s going to be throwing up after all the games because he’ll be playing so many snaps. 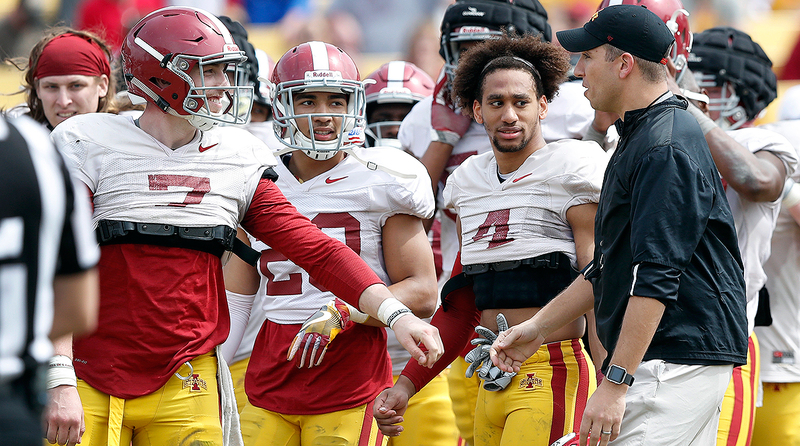 Lanning (7) took an interception back for a touchdown during Iowa State's spring game, and coach Matt Campbell has been pleased with his progress. The transition to defense has been an interesting one. As rugged as Lanning played on Saturdays, he wasn’t used to getting hit or hitting people at practice every single day. “Those first two weeks were eye-opening,” Lanning says. “I was dying.” Iowa State’s spring break came at a fortunate time for Lanning. “I needed that break. When I came back, I felt great and started to get the hang of things where I was playing fast and quit thinking and just reacting. Most fun I’ve ever had. I feel like at quarterback you get to do all the cool things, but you’re also stuck in a little area where you’re either throwing it, handing off or running it. The thing about linebacker is you’re getting up in there, covering people, outside the box. It’s fun and it’s different." Lanning has also adjusted his weight training to help with the rigors of his new position, incorporating more shoulder work, and has put on five more pounds (he’s up to 230). Chris Spielman, the legendary Ohio State tackling machine, says the key physical trait that most people overlook when it comes to linebacker is vision. “As a quarterback, if [Lanning] can see it and understand [angles and O-line tells] that could really be an advantage for him,” the former NFL All-Pro says in regards to Lanning’s position switch. Iowa State linebacker coach Tyson Veidt calls Lanning a throwback. “Athletically he fits what we would recruit and look for there,” Veidt says. “The fundamental techniques are simply what he hasn’t done and is working diligently on to improve." Campbell, says he wishes he were at Iowa State a year earlier because he thinks Lanning could have been groomed to be an elite linebacker. “He is a really talented football player,” he says. “He’s exactly what you want in your program. He’s the reason why we made the improvement we had last year just because of his toughness and his will. He’s special, a really unique kid.